As I've kept reading Contemporary Drawing, I have been preparing surfaces to work on. I prepared about twenty panels with rabbit skin glue and gesso. I prepared book pages. I have worked bigger, smaller, roughe,r smoother. I love reading alongside working as I think a little more about choices I make in light of the text. In this, I glued pages together in a book I began altering ten years ago. It was no longer relevant and I didn't feel I needed to preserve the pages any longer. I could imagine the name and some of the words on the page in a double page spread - it could be something relevant now, something intentional that would use the surface to say something more. I went through my sketchbooks and found a drawing that felt like the title then I found some photos from the area to change the composition and choose some specifics from. The original drawing is vertical. I know this scene. 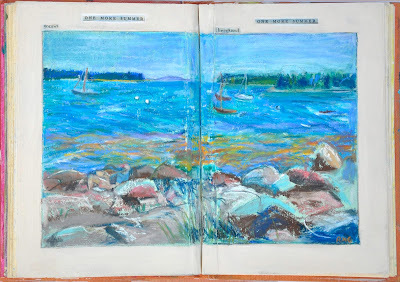 It is a windy day and the summer is ebbing so I was looking at the pastel and making choices from my memory mostly.